This species is widespread throughout central North America and is considered stable and secure throughout its range, although some Canadian occurrences are declining as are occurrences at the edge of the range of the species. 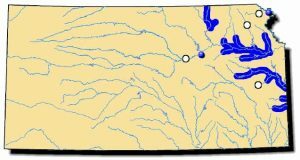 It ranges throughout the Mississippi River drainage from western Pennsylvania to Minnesota, west to Kansas and Nebraska, and south to Arkansas. In the St. Lawrence River system it occurs from Lake Huron to Lake Champlain also in the Canadian Interior Basin in parts of the Red River of the North and the Winnipeg River. Comments: The pink heelsplitter gets its name from the large, flat wing often found extending from the dorsal side of the shell. This “wing” has a very narrow edge and if stepped on, might easily injure a person’s bare foot. The shell’s interior has a showy, purplish-pink nacre that may be tinged with a bronze color. Young shells have green rays that fade with age. The glochidia within this genus Potamilus are uniquely hatchet-shaped. Other mussels have round-shaped glochidia. Research has shown this species can be utilized in the culture of purple pearls. Other colloquial names for the pink heelsplitter are “hatchetback” and “pancake.” In Kansas, the pink heelsplitter is restricted to the Kansas and Marais des Cygnes river basins. 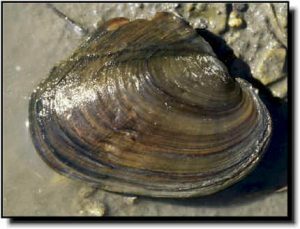 In these flowing waters, it is more commonly found in pools and sluggish areas where it can be found in a mix of gravel and silt substrates.